The small town of Hüttenberg in Carinthia has a long history as a centre for mining and a pretty historic core. As a side-effect of an exhibition organised by the federal province of Carinthia, the town centre was renovated in an endeavour to stimulate tourism. This failed, however, with the opening of the Heinrich Harrer Museum, the appeal of the town was increased. Nevertheless, today Hüttenberg is still a bit of an insider′s piece of advice for sightseeing destinations. Let′s start with a bit of history: The iron mines in the surroundings of modern Hüttenberg date back to pre-Roman (Celtic) times, when the ore was mined to produce the desired "ferrum noricum" iron. The current town was first mentioned in a document dating back to 1266 and earned the privilege to arrange markets in the 14th century. Ruled by the Prince Archbishops of Salzburg, Hüttenberg became an economic centre for the entire region. In the 19th century, the local mining companies consolidated and formed a co-operative, the Hüttenberger Eisenwerks-Gesellschaft. Alongside with the mining, factories for the melting and iron production developed, which peaked during WWII. After the war, the productivity of the mines ceased and they were finally closed in 1978. This was followed by a major economic crisis: Many young people moved away, the station was closed and even the rails were demolished, many small businesses left Hüttenberg. This explains the province′s endeavour to re-vive the town with an exhibition on its mining history in 1995. However, on a long-term, it helped little to improve the economic situation. 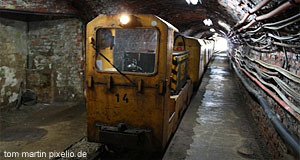 Today, visitors can see a show mine in nearby Knappenberg. Small museums and exhibitions supplement the mine itself, for example one dedicated to semi-precious stones. Otherwise, sightseeing attractions include the late-Gothic parish church St. Nikolaus, which dates back to the 15th century; the nearby church of pilgrimage Maria Waitschach and the castle Schloss Süßenstein. The most impressive attraction, however, is at the same time the most recent addition to Hüttenberg′s tourism baits. The "Heinrich Harrer Museum" was first opened in 1992. Heinrich Harrer was born near Hüttenberg. As a young and ambitious Nazi, Harrer engaged in risky sport endeavours that took him to the Olympic Games as a skier, to the summit of the Eiger and to Adolf the Führer who liked that kind of stuff. Later, he attended an expedition to the Himalaya in 1938, was arrested by the English as a German citizen, managed to escape in 1944, went to Tibet and became the private tutor to the young Dalai Lama. For further details, read the book "Seven Years in Tibet" or see the movie. Upon his return to Austria, he indulged in golf, became Austrian champion in 1958, did documentaries, travelled around the World, got married to Alfred Wegener′s daughter, sold books and lived mostly in Liechtenstein - I suspect for tax reasons. However, when in Austria, he always appeared to be deeply rooted in Hüttenberg and its surroundings, so it does make sense that a museum that houses much of his private collection of Tibetan stuff is here. The museum was opened in the presence of His Holiness the 14th Dalai Lama, a highly popular figure in Austria, probably because he always smiles. Harrer and the Dalai Lama remained friends for a lifetime. The exhibits contain a throne for the Dalai Lama, Tibetan paintings (thankas), trumpets made of human bones, Tibetan costumes and other folk art. Much of the non-Tibetan parts of the Museums are dedicated to other aspects of Harrer′s life: His golf clubs, souvenirs from his expeditions to exotic countries and manuscripts. Nearby attractions include Friesach, the mighty castle of Hochosterwitz and Gurk.